Ambigram. Noun. A design that may be read as the same word or phrase – or sometimes as two different words or phrases – oriented in two different ways. That is, more or less, the definition of an ambigram, according to Webster’s Dictionary. I like ambigrams, always have. I have an ambigram as a tattoo. So when I found iAmbigram Lite, I was pretty happy to give it a spin, pun intended. It’s an inexpensive little application, and, I am told, a lighter version of a full iAmbigram to come. 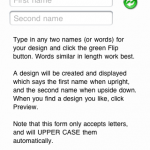 The lite version lacks the ability to upload the ambigram you create and purchase it on clothing or other items. And I can live without that. 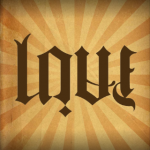 It works pretty easily – enter two words, and it will create an ambigram of them. If you want just one word that rotates on itself, enter the same word on both lines. They app then uploads to the “ambigram server,” or so it says, and returns your ambigram for you to rotate and spin over and over and over. 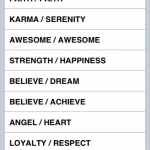 If you don’t know what words to use, there are suggestions in several categories, like opposites, family, etc. Once you create your ambigram, you can try spinning it and inverting it to see how it looks. When you’re happy, click “accept” and see your ambigram on one of three different backgrounds. 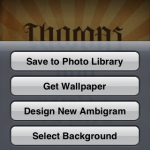 The “i’nformation icon in the upper corner brings up a menu that lets you save your ambigram in the photo gallery, change the background, or start over. But – there’s a catch. 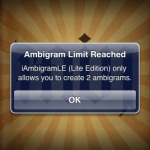 iAmbigram Lite only allows you to create two ambigrams for your $0.99. That’s all. So if you’re someone like me, you’ll have used up the app after about three minutes of playing around with it. A suggestion for the developer – make it free while it has its limitations, then charge for it when it’s the full version. Hook ’em, THEN charge ’em, man, like heroin. So, iAmbigram Lite was fun, but short-lived fun. I’d suggest you save your dollar and wait for the full version. Suggestions, if you don’t know what to ambi. Turn your monitor over – you’ll see love turn into pain. What I can do with my ambigram.